Thangathurai, known as mama, uncle, was in charge of the secret group. There were about 25 youths, most of them from Valvettithurai and relatives. In early 1970, Thangathurai bought two revolvers, of .22 and .38 calibre. They were used for shooting practice and as models for local manufacture. Thangathurai ordered the group to manufacture similar revolvers. Kannady, a radio mechanic, was in charge of that project. Thamby Pirapaharan was his assistant. They dismantled the revolvers, piece by piece and assembled them. They mastered the technology quickly. We knew nothing about making revolvers. In fact, most of the boys saw those weapons for the first time. I asked Kannady and Pirapaharan to try. They sat on the verandah of the house we regularly met with a few screwdrivers and hammers. They dismantled the revolvers in no time. They placed the pieces carefully on a newspaper and then assembled the revolver. Both possess remarkable power of observation and very good memory. The group mastered the art of manufacturing revolvers. They did manufacture some of them. They also discovered innovative methods to manufacture bullets. They experimented with the chemicals found in matchsticks. In the end they used the chemicals found in firecrackers. They preferred the moolai vedi, the triangular crackers, known for their powerful explosions. The revolvers Sivakumaran used during that time and the one Kuttimani used to kill Ulaganathan, Tisaveerasingham used to shoot Vaddukoddai MP A. Thiyagarajah, and Pirapaharan used to slay Alfred Duraiappah were all locally manufactured. The group also perfected the art of making bombs. The entire group was involved in the project. It was riskier than the manufacture of revolvers. There were two unexpected explosions. The first occurred in 1970, in the palmyrah grove behind Thondamanaru Vidyalayam from where they stole the chemicals. They were packing the explosives when the bomb went off. Sinna Sothi was injured. Next year’s blast was more serious. Thangathurai, Sinna Sothi, Pirapaharan and Nadesuthasan were burnt. Pirapaharan’s injury was on his right leg. It took some time to heal and left a black scar. Pirapaharan was proud of it. He showed it to all his friends. He joked, saying that he is now a karikalan. It meant black-legged person. He was an admirer of the famous Chola King Karikal Cholan. This king had a black scar in his leg and took the name Karikal Cholan, the black-legged Cholan. He built the Chola kingdom into a mighty empire. Pirapaharan adopted the name ‘Karikalan‘ as his nom de geurre. He was charge-sheeted as Karikalan in the 1982 Pondy bazaar shoot out. The police learnt about the story and searching the leg for the black scar formed an essential part of the Pirapaharan search. Pirapaharan’s interest in the manufacture of weapons and bombs continues even today. He personally examines the new weapons captured from the army and decides on the modifications that could be effected to make their use more effective and economical. He had effected modifications to the heavy guns and artillery pieces captured during the LTTE’s attacks and camouflaged them in such a way that even the advanced direction finders the army purchased from Western countries failed to detect them. Pirapaharan was 14 years old when he was introduced to the secret group by Periya Sothi, his cousin, and was in the GCE OL class. He absented himself from school and attended political meetings and discussions. Political debate had intensified in the Jaffna peninsula after the Federal Party quit the Dudley Senanayake government in September 1968 and decided to support the government from the opposition. Infuriated youths challenged that stand and called it hypocrisy. Thanthai Chelva’s explanation that their agreement with the UNP held failed to pacify the youths, especially those of V. Navaratnam’s Suyadchi Kalagam. Pirapaharan, an ardent convert to the vision of a separate state went round meeting youth agitators like Eelaventhan and Kovai Mahesan, arguing that the Federal Party should put an end to its humbug and adopt the separate state solution to the Tamil problem advocated by Suntharalingam and Navaratnam. Suntharalingam was the first to propose the establishment of a separate Tamil state. In 1958, soon after the riots, he moved a motion in parliament calling for the establishment of a separate state for the Tamils and named it Eelam. He declared firmly that Tamils would never accept subservience. Based on his experience of dealing with Sinhala intellectuals and politicians, he declared that the aim of the Sinhalese was to make Sri Lanka a Sinhala Buddhist country. He said Sinhalese would never honor political agreements and never concede to the Tamils their language rights. Suntharalingam called for the restoration of the status quo ante: a separate Tamil state of Eelam, comprising the ancient Tamil areas of North and East Lanka. His call for a separate state for the Tamils failed to click. Voters of Vavuniya rejected his party, the Eela Thamilar Ootuman Munnani in 1960 March and in the 1965 parliamentary elections. In the first election, he polled 4231 votes against the independent candidate, T. Sivasithamparam’s, 5370 and in the 1965 election his support slipped to 3952 against T. Sivasithamparam’s 7265, who contested on Tamil Congress ticket. In 1970, he shifted to Kankesanthurai to challenge Federal Party chief Chelvanayakam, but could only collect 5788 votes against Chelvanayakam’s 13,520. Navaratnam’s Suyadchi Kalagam (Self-rule Party), which contested the 1970 polls fared no better. It was also rejected by the Tamil people. Navaratnam contested the Kayts constituency which he had held since 1963, but his supporters refused to move along with him in his new party. He polled 14,946 votes in the 1963 by-election and 13,558 in 1965, but in 1970 collected only 4758 votes. The bulk of his supporters remained with the Federal Party and voted for its new candidate, K. P. Ratnam. The entire Jaffna peninsula rejected Navaratnam’s call for a separate state. It is our firm conviction that division of the country in any form would not be beneficial, neither to the country, nor to the Tamil-speaking people. Hence, we appeal to the Tamil-speaking people not to lend their support to any political movement that advocated bifurcation of our country. … it is also an opportune moment to tell the government and the Country at large, that Sinhalese governments and political leaders could no longer be trusted to honor their plighted word to the Tamils and that the two peoples have reached the parting of the ways. Suntharalingam and Navaratnam, though they lost the election, had successfully sown the seed of separation in the minds of the youths. Some of them were made to think seriously of alternative means of attaining that goal. They argued that non-violence had miserably failed. Sinhalese had used force to silence peaceful protest. Force should be met with force. That is the only way to make the Sinhalese respect the Tamils. Hit back hard, to stop them hitting, they reasoned. The Federal Party won 13 and Tamil Congress 3 seats in the election held on 27 May 1970. The United Front comprising the Sri Lanka Freedom Party (SLFP), the Lanka Sama Samaja Party (LSSP) and the Communist Party (CP) won 106 seats and, with the six nominated members, had 112 members, a clear two-third majority in the 151-member parliament. United National Party was reduced to 17. Sirimavo Bandaranaike, the United Front leader, formed the cabinet. She appointed Dr. Badi-ud-din Mahmud, former principal of Gampola Zahira College, as the minister of education. One of his first acts was the announcement of the cabinet decision to introduce media-wise standardization, which created the environment suitable for the germination and growth of the seed of separation. Badi-ud-din told Parliament that Sinhalese were discontented with the university admission scheme which resulted in Tamil dominance of the prestigious professional courses, especially medicine and engineering. He gave three reasons which he said favoured Tamil students. The first was, due to historical reasons, Jaffna possessed some of the country’s best schools. The second, Tamil examiners over-marked the scripts of Tamil students. The third, Tamil university teachers, who conducted the practical examination for Tamil students, helped them. He said the cabinet felt the need to correct these injustices done to Sinhala students. He announced the abolition of practical examination for science subjects and media-wise standardization. The Sirimavo Bandaranaike government was only reacting to the pre-election campaign conducted by Buddhist pressure groups which alleged that Tamil dominance in the professional and science study courses was due to favouratism by Tamil examiners and who wanted the merit system in university admission abandoned. The charges that Jaffna possessed better-equipped schools and that Tamils got a bigger share of the places in the professional and science courses were true. In 1974 Sri Lankan Tamils held 37.2 percent of the places in science and engineering courses, 40.5 percent in medicine and dentistry, 41.9 percent in agriculture and veterinary science courses in the University of Ceylon. The trend continued until 1971 when Tamil made up 35.2 percent of all admissions to the science-based courses in the university, obtaining 40.8 percent in engineering and 40.9 percent in medicine. Badi-ud-din Mahmood’s charge that Tamil students obtained this bigger share by deception- favouratism in the practical examination and by the over marking of their scripts angered Tamil students, who claimed their better performance was due to their diligence and training. From 1942, when the University of Ceylon was founded, until 1957, university teaching was in the English language, and Sinhala and Tamil students answered the same entrance examination question papers in English. From 1957, when Sinhala and Tamil were introduced as the languages of instruction, the procedure underwent a change. Students of both mediums answered the same question papers, but in their respective languages. Marks obtained by the Sinhalese and Tamil students were compiled into a single list and arranged in descending order. Available university places were filled from the top. This arrangement was called the merit system. In the media-wise standardization, the lists of marks obtained by the Sinhala and Tamil students are compiled separately and standardized against each other. The scheme of standardization signals the doom of the whole of the Tamil community. It has deprived thousands of Tamil youths with GCE Advanced Level qualifications, the opportunity for either further higher education or employment. Standardization has wiped out the last resort of the Tamils, that is professional qualifications and professional employment opportunities. We never had any faith in the Tamil Congress. It is too conservative and insensitive to new ideas. The Federal Party too is getting fossilized and is losing grip on the problems of the youth, especially students. We need a new organization to voice our grievances. The group resolved to form themselves into a new organization. They named it Thamil Manavar Peravai, (Tamil Students Union – TSU).Satyaseelan was elected its president and P V Tissaverasingam the secretary. Sivakumaran, Ariyaratnam, Muthukumarasamy and fa ew others were present. Membership was restricted to GCE Advanced Level students. Sivakumaran dropped out in a few months and Pirapaharan, 15, joined the TSU after it extended its membership to students in lower classes and recent school leavers. A TSU delegation met Amirthalingam in December 1970 and urged him to take up the matter with the Federal Party General Council, which was scheduled to meet on 12 January 1971 in Jaffna. Amirthalingam, who was handling the youth, told the General Council that standardization had angered the youths and urged the parliamentary group to raise the matter in Parliament. Amirthalingam was then out of parliament after his defeat in the 1970 election by former Karainagar Hindu College principal A. Thiyagarajah. The General Council failed to realize the seriousness of the standardization problem and decided to raise it along with five other matters that affected the Tamils. The General Council appointed a 11-member committee headed by Thanthai Chelva to meet the prime minister and raise those matters. Prime Minister Sirimavo Bandaranaike directed the committee to meet Badi-ud-din Mahmood, who agreed to make adjustments in other matters but not in standardization. He told them that this was a cabinet directive and he was only implementing it. He had no authority to adjust or alter it. The TSU stepped up its agitation as the impact of media-wise standardization was felt in 1972. Sinhalese historian K. M. de Silva has pointed out that the qualifying marks for admission for the medical faculty in 1972 was 229 (out of 400) for the Sinhalese and 250 for the Tamils. For dentistry, it was 215 for Sinhalese and 245 for Tamils and for veterinary science 200 for Sinhalese and 230 for Tamils. This depressed the intake of Tamil students to the university, and in 1972 Tamils secured 33.6 percent of the places in the science-based courses against 63 percent by the Sinhalese. This dip continued in 1973 when the share was 29.5 percent Tamils and 67.4 percent Sinhalese. Tamil students were convinced that they were being discriminated against and they could not expect justice from any Sinhalese-dominated government. The way out of this predicament was a separate state and they concluded that armed struggle was the only practical means to achieve that goal. Sivakumaran and Pirapaharan preached that gospel with vigour and enthusiasm to their colleagues. The two did not meet. They moved in two separate circles. Their friends confide they had certain common characteristics. They were restless. They wanted action. They admired Subash Chandra Bose. They would sit up the entire night discussing armed struggle. Rudramoorthy Cheran has said this of Sivakumaran. He (Sivakumaran) would discuss all night , emphasizing the need for an armed struggle. Once he began speaking, it was very difficult to stop him. He would talk about the past glory of the Tamils and conclude saying that such glory could be restored only in a separate state which could be achieved through armed struggle. Pirapaharan’s first act of violence occurred in early part of 1970 when he and three of his friends decided to burn a state bus. They agreed that destruction of state property was the best way to show one’s disapproval to the actions of the state. They decided that such action should not cause harm to the innocent public. Burning an empty bus returning from Valvettithurai to the shed in Point Pedro after its last night trip was what they decided to do. Pirapaharan and his friends, armed with a can of petrol and a box of marches, waited in a dark corner on a lonely spot in the road near Valvettithurai. They saw the headlights of the bus. Pirapaharan’s friends panicked. They melted into the darkness. Pirapaharan rolled the coconut log they had kept ready onto the road. He chased away the driver and the conductor when they got down to remove the log, splashed the petrol on the bus and set it alight. That won him the admiration of his friends. 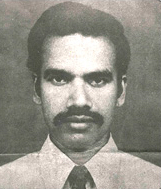 Sivakumaran’s first act of violence was in September 1970. Deputy Minister of Cultural Affairs, Somaweera Chandrasiri, paid a visit to Urumpirai Hindu College. He was a Sinhala extremist. Sivakumaran placed a time bomb below his car and slipped away. The car was blown to pieces, but no one was injured. Sivakumaran followed this with an attempt to assassinate Jaffna Mayor Alfred Duraiappha in February 1971. He threw a hand grenade on to Duraiappah’s car parked along the Second Cross Road in Jaffna town. The car was damaged, but Duraiappah was not inside. Duraiappah was the chief organizer of the Sri Lanka Freedom Party in the Jaffna District during his term as mayor from 1971 to 1975. While TSU was organizing street protests and conducting poster campaigns, the United Front government initiated steps to implement its election promise to establish a Constituent Assembly to enact a new constitution that would “declare Ceylon a free, sovereign and independent Republic.” The Federal Party, which had obtained a mandate from the Tamil people for a Federal Constitution, decided to cooperate with the government in the constitution-making process. Amirthlingam told the two MPs that LSSP deputy leader Dr. Colvin R. de Silva, who was appointed Minister of Constitutional Affairs in addition to Minister of Plantation Industries, had told Tiruchelvam that various concessions would be given to the Tamil community through the new constitution and they did not want to miss that opportunity. Two languages would help build a single nation and a single language two nations. Soon they realized that their trust in Dr. de Silva was misplaced.